Probably the most sophisticated Eastern attempt to deal with the tension we are considering is the Bhagavad-Gita. This is a religious writing probably produced around 200 B.C. in India. It has been the inspiration for multitudes of Hindus through the centuries and most notably for Indian spiritual and political leader Mahatma Gandhi. In it the individual is urged to participate in acts of charity. At the same time, however, the individual is urged to enter into these acts in “a spirit of detachment.” Why? Because the proper attitude is to understand that none of these experiences really matter. It is the state of consciousness that rises above personality which is important, for personality is, after all, an abnormality within the impersonal universe. Alternatively, the East proposes a system of “endless cycles” to try to give some explanation for things which exist about us. This has sometimes been likened to the ocean. The ocean casts up waves for a time, but the waves are still a part of the ocean, and then the waves pull back into the ocean and disappear. Interestingly enough, the Western materialist also tries to explain the form of the universe by a theory of endless cycles. He says that impersonal material or energy always exists, but that this goes through endless cycles, taking different forms – the latest of which began with the “big bang” which spawned the present expanding universe. Previously, billions and billions of years ago, this eternal material or energy had a different form and had contracted into the heavy mass from which came the present cycle of our universe. Both the Eastern thought and the Western put forth this unproven idea of endless cycles because their answers finally answer nothing. We have emphasized the problems involved in these two alternatives because they are real. It is helpful to see that the only serious intellectual alternatives to the Christian position have such endless difficulties that they actually are nonanswers. We do it, too, because we find people in the West who imagine that Christianity has nothing to say on these big issues and who discard the Bible without ever considering it. This superior attitude, as we said earlier, is quite unfounded. The real situation is very different. The humanists of the Enlightenment acted as if they would conquer all before them, but two centuries have changed that. One would have imagined at this point that Western man would have been glad for a solution to the various dilemmas facing him and would have welcomed answers to the big questions. But people are not as eager to find the truth as is sometimes made out. The history of Western thought during the past century confirms this. If not Mohandas Karamchand Gandhi, the Indian Independence struggle would have taken longer with more blood shed, division and war. When senior leaders of the Hindu political groups urged Gandhi to respond ‘violence with violence’ and ‘sword with sword’, he opposed insisting and exhorting the path of non–violence and peace, which was Gandhi’s biggest sword to combat the trained and fully equipped forces.For sure this great man is one of the most respected leaders of modern history, for not only his life, but also his ideals and his message to the people.Although Hindu, Gandhi had a very close connection with Christianity and admired Jesus very much, often quoting from his favorite ‘Sermon on the Mount’ chapter in Mathew 5–7.When the missionary E. Stanley Jones met with Gandhi he asked him, “Mr. Gandhi, though you quote the words of Christ often, why is that you appear to so adamantly reject becoming his follower?”Gandhi replied, “Oh, I don’t reject Christ. I love Christ. 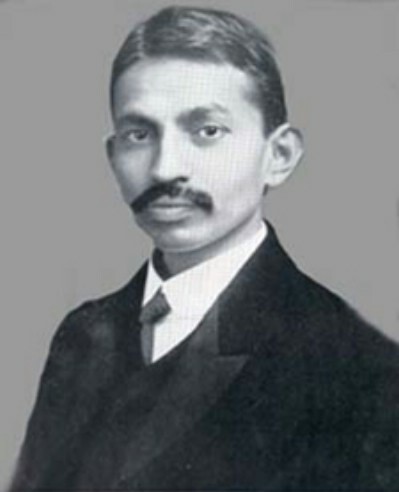 It’s just that so many of you Christians are so unlike Christ.”“If Christians would really live according to the teachings of Christ, as found in the Bible, all of India would be Christian today,” he added.Gandhi’s closeness with Christianity began when he was a young man practicing law in South Africa. Apart from being attached with the Christian faith, he intently studied the Bible and the teachings of Jesus, and was also seriously exploring becoming a Christian, which led him to his discovery of a small church gathering in his locality. These strongly entrenched Biblical teachings have always acted a panacea to many of India’s problems during its freedom struggle. After deciding to attend the church service in South Africa, he came across a racial barrier, the church barred his way at the door. “Where do you think you’re going, kaffir?” an English man asked Gandhi in a belligerent tone. This infamous incident forced Gandhi to never again consider being a Christian, but rather adopt what he found in Christianity and its founder Jesus Christ. In many ways Gandhi was right, the intense proselytization by Christian missionaries in India through force and allurement forced him to make many scathing statements against Christian missionaries, which several times inspired them to retrospect and change the way of approach in ‘Evangelism’. “If Jesus came to earth again. He would disown many things that are being done in the name of Christianity,” Gandhi said during his meeting with an English missioner. Here I am remembered of Sadhu Sundar Singh who is said to have done more to “indeginize” the churches of India than any figures in the twentieth century. 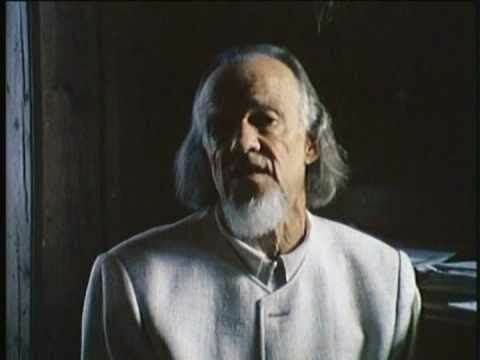 “You have offered us Christianity in a Western cup… Give it to us in an Eastern bowl and we will drink of it,” is a famous statement by Singh, who converted from Sikh to Christianity after his personal experience with Jesus, who appeared in his room on one morning in the year 1905, when he was just fifteen years old. Mahatma Gandhi truly was the pioneer of Satyagraha—resistance to tyranny through mass civil disobedience, firmly founded upon ahimsa or total non–violence—which led India to independence and inspired movements for civil rights and freedom across the world. He is officially honored in India as the Father of the Nation; his birthday, 2 October, is commemorated in the country as Gandhi Jayanti, a national holiday, and worldwide as the International Day of Non–Violence. When still alive, Mohandas Gandhi had many admirers, both in India and abroad. But his martyrdom in 1948 made him an even greater symbol of peace. Twenty-one years later, he was commemorated on this double-sized United Kingdom postage stamp. Luc Tuymans, opening of his exhibition “Against the Day” at WIELS Contemporary Art Center, Brussels, April 2009. Tuymans was born in Mortsel near Antwerp, Belgium. He began his studies in the fine arts at the Sint-Lukasinstituut in Brussels in 1976. At the age of 19 Tuymans encountered a series of El Greco paintings in Budapest while working as a guard for a European railway company. Subsequently he studied fine arts at the Ecole Nationale Supérieure des Arts Visuels de la Cambre in Brussels, Belgium (1979–1980) and at the Koninklijke Academie voor Schone Kunsten in Antwerp, Belgium (1980–1982). He abandoned painting in 1982, studying art history at the Vrije Universiteit, Brussels (1982–6), and spent three years experimenting with video and film until 1985. He holds an honorary doctorate from the University of Antwerp in Antwerp, Belgium and was honored by the Belgian government when they bestowed upon him the title of Commander, Order of Leopold in 2007. He is married to Venezuelan artist Carla Arocha. Tuymans emerged in at a time when there were not many new contemporary painters making, or using imagistic paintings; others include John Currin or Elizabeth Peyton. Tuymans’ subjects range from major historical events, such as the Holocaust or the politics of the Belgian Congo, to the inconsequential and banal – wallpaper patterns, Christmas decorations, everyday objects. Tuymans first made his mark in the 1980s, when he began to explore Europe’s memories of World War II with harsh, elegant paintings like Gas Chamber (1986), which depicts the Dachau concentration camp. The artist later aroused interest in 2000 with his series of political paintings titled Mwana Kitoko (“beautiful boy”), which take themes out of the state visit of King Baudouin of Belgium in the Congo in the 1950s. The works were exhibited in 2000 at the David Zwirner Gallery and the following year in the Belgian Pavilion at the Venice Biennale. The most noted painting was of the king himself in his white military uniform. Tuyman’s sparsely-colored, figurative are typically painted with fleet brush strokes of wet paint on wet paint on a modest scale and derive their subjects from pre-existing imagery which includes photographs and video stills, and often appear slightly out-of-focus. The blurriness is actually sharp because, unlike with Gerhard Richter, it is not wiped away but just painted. His paintings embrace a number of formal and conceptual oppositions, echoed in Tuymans’s own explanation that “sickness should appear in the way the painting is made,” yet in “caressing the painting” there is also pleasure in its making. These statements are characteristic of Tuymans’s self-conscious and tenaciously semantic shaping of the philosophical content in his work. Tuymans often works in series, a method whereby one image can generate another and where images can be formulated and then reformulated. He continuously analyses and distils his images, making many drawings, photocopies and watercolours before making the high-intensity oil paintings. Two early series are the cycle Die Zeit (Time) (1988) about the holocaust; Heimat (German for ‘homeland’) (1996), paintings in which Tuymans sketches a wry picture of the revived self-awareness of the Flemish nationalist; and the series Passion (1999) about the essence of religious belief. Between 2007 and 2009 Tuymans worked on a triptych, which began with Les Revenants and Restoration (2007) about the power of the Jesuit Order; continued with Forever. The Management of Magic, relating to the world phenomenon Walt Disney; and ended with Against the Day (2009), a series on TV reality shows. 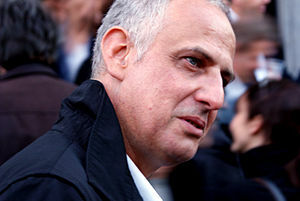 At documenta 11 in 2002, where the selection of work that year focused on works of art with political or social commentary, many expected Tuymans to make new works in response to the New York attacks on 11 September 2001. Instead he presented a simple still-life executed on a massive scale, deliberately ignoring all reference to world events, leading to negative critiques. Tuymans represented Belgium at the Venice Biennale in 2001. He has been the focus of several retrospectives at various international institutions, including the Műcsarnok Kunsthalle in Budapest, Hungary; Haus der Kunst in Munich, Germany; the Zachęta National Gallery of Art in Warsaw, Poland; the Tate Modern, London, England (2004); Museu Serralves, Porto, Portugal; Musee d’Art Moderne et Contemporain (MAMCO), Geneva, Switzerland (both 2006); and, most recently (2011) the BOZAR Centre for Fine Arts in Brussels, Belgium. The artist’s first comprehensive U.S. retrospective opened in September 2009 at the Wexner Center for the Arts in Columbus, Ohio, and travelled to the San Francisco Museum of Modern Art, the Dallas Museum of Art and the Museum of Contemporary Art, Chicago. Against the Day, an exhibition of works inspired by one of Tuymans’ favorite authors, Thomas Pynchon, originated at Wiels Centre d’Art Contemporain, Brussels, and subsequently travelled to Baibakov Art Projects, Moscow, and Moderna Museet Malmö, Sweden. In 1992, Tuymans was invited to show at the documenta for the first time. His numerous, recent group exhibitions have since included Compass in Hand: Selections from The Judith Rothschild Foundation Contemporary Drawings Collection, The Museum of Modern Art, New York; Mapping the Studio: Artists from the François Pinault Collection, Palazzo Grassi, Venice, Italy (2009); Collecting Collections: Highlights from the Permanent Collection of the Museum of Contemporary Art, Los Angeles, Museum of Contemporary Art, Los Angeles, California; Doing it My Way: Perspectives in Belgian Art, Museum Küppersmühle für Moderne Kunst, Duisburg, Germany (2008); What is Painting? Contemporary Art From the Collection, The Museum of Modern Art, New York, New York; Fast Forward: Collections for the Dallas Museum of Art, Dallas Museum of Art, Dallas, Texas; The Painting of Modern Life, Hayward Gallery, London, England and Castello di Rivoli, Turin, Italy (2007); Essential Painting, National Museum of Art, Osaka, Japan; Infinite Painting: Contemporary Painting and Global Realism, Villa Manin Centro d’Arte Contemporanea, Codroipo, Italy (2006). Luc Tuymans is represented by David Zwirner, New York, and Zeno X Gallery, Antwerp. Tuymans also curates exhibitions, and is organizing the second in a series of cross-cultural exhibitions that brings together Belgian and Chinese art. His exhibition, The State of Things: Brussels/Beijing, will travel from the Centre for Fine Arts, Brussels, Belgium to Beijing. In 2010-2011 he will was the guest curator for the inaugural Bruges Central art festival in Bruges, Belgium. Tuymans has also engaged in pedagogical work, he was a guest tutor at the Dutch institute Rijksakademie van beeldende kunsten, where he mentored and significantly influenced emerging painters such as the Polish Paulina Olowska and Serbian-born Ivan Grubanov. Work by the artist is held in the public collections of various museums, including the Solomon R. Guggenheim Museum, New York, New York; Art Institute of Chicago, Chicago, Illinois; The Museum of Modern Art, New York, New York; San Francisco Museum of Modern Art, San Francisco, California; Los Angeles County Museum of Art, Los Angeles, California; Museum van Hedendaagse Kunst, Antwerp, Belgium; Stedelijk Museum voor Actuele Kunst, Ghent, Belgium; Bonnefanten Museum, Maastricht; Centre Pompidou, Paris; Kunstmuseum Wolfsburg, Wolfsburg; Museum für Moderne Kunst, Frankfurt; Pinakothek der Moderne, Munich; and the Tate Gallery, London. In 2005, Sculpture (2000), part of Tuymans’ Mwana Kitoko: Beautiful White Man series, was sold at Christie’s New York, for $1,472,000. His famous painting of Condoleeza Rice hardly flattered the American secretary of state, and so you’ve got to admire Queen Beatrix’s good grace in modeling for the Belgian Painter Luc Tuymans. 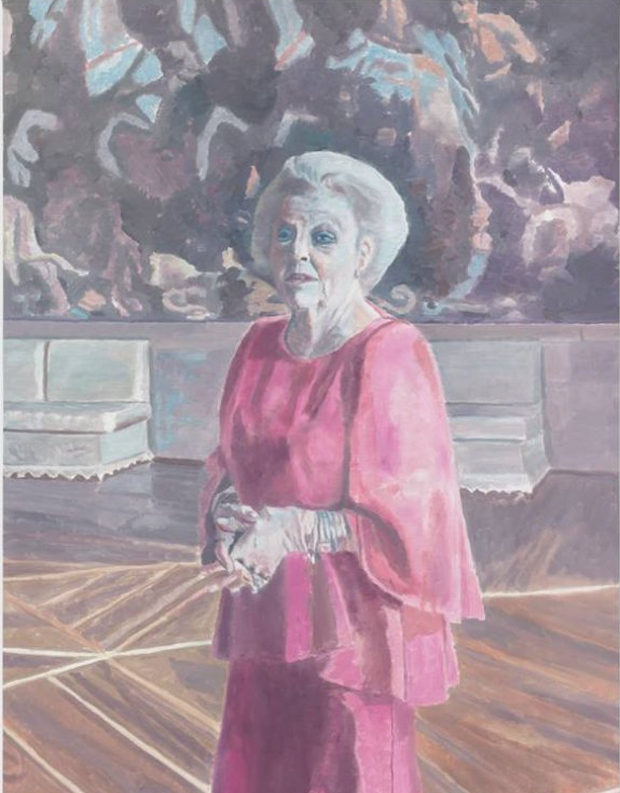 She posed for Tuymans in The Orange Hall of her Huis ten Bosch Palace in The Hague earlier this year, in order for the portrait to be shown at the re-opening of Amsterdam’s Stedelijk Museum, which took place this weekend. In an interview for the British Independent newspaper, he discussed his own Dutch heritage. Tuymans was born in Antwerp in 1958, to a Dutch mother and a Flemish Belgian father. The Queen Beatrix portrait is on permanent display at the Stedelijk. Can’t get to Amsterdam? Then take a look at our two Tuymans books; one reproduces over 100 new works by the renowned Belgian painter, while the other is the only monograph spanning his entire career.